"I submitted these for the 2009 Dandelion Cook-off at Breitenbach Winery Dandelion Festival. These were a crowd favorite, especially the Asian dipping sauce. If you like dandelion greens, you'll love these. Formed dumplings can be frozen up to 2 months." Mix pork, dandelion greens, napa cabbage, bok choy, 4 minced green onions, 1 tablespoon of ginger, 3 cloves of garlic, bamboo shoots, 3 tablespoons of soy sauce, white pepper, salt, 1 teaspoon of sugar, and 4 teaspoons of sesame oil. Chill in the refrigerator 6 to 8 hours, or overnight. Beat the egg white with the water in a small bowl and set aside. Place 1 tablespoon of the pork mixture into a wonton wrapper, working one at at time. Cover additional wrappers with a moist towel to prevent drying. Brush the edges of the wrapper with the egg white mixture. Fold the wrapper and seal the edges with a moistened fork. Spray a large skillet with cooking spray. Heat 2 tablespoons for vegetable oil over medium-high heat. Working in batches, place the dumplings into the skillet, seam side up. Cook until the dumplings brown slightly, 30 seconds to 1 minute. Pour 1/2 cup of water into the skillet and cover. Gently steam the dumplings until the oil and water begin to sizzle, 7 to 8 minutes. Once the water is cooked off, flip the dumplings and continue cooking until the bottom begin to brown, 3 to 5 minutes. Repeat in batches with the remaining dumplings, oil, and water. Serve with dipping sauce. To make dipping sauce: Combine chili oil, hoisin sauce, 1/2 cup of soy sauce, 4 teaspoons of sesame oil, 1 teaspoon of sugar, balsamic vinegar, 1 teaspoon of ginger, 2 tablespoons of green onion, and 2 cloves of garlic in a bowl. 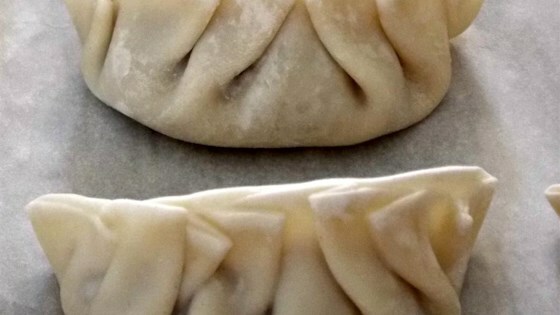 See how to make authentic Hong Kong-style pork dumplings.